All our A1 Canvas materials are made here in Melbourne. Sunblinds are the most trusted and widely used of all our blinds. Add a touch of style, class and functionality to your Melbourne home with sunblinds. Protect your home from harmful and damaging UV sun, while keeping the room cool over the summer months. A1Blinds have been providing Sunblinds to Melbourne homes and office buildings since 1958. We custom measure and install Sunblinds to your requirements and provide with a lifetime warranty. The quality in all our products and services are second to none. Originally designed for sun protection using blockout canvas material, outdoor Sunblinds have evolved to keep up with the modern styles of homes to ensure they not only add protection from the harsh Melbourne sun, they also add value to your home. Give your home protection from the harsh Australian sun and harmful damaging UV rays. Sunblinds cool your home, protect carpets and furniture from fading and add value to your property. We have a design & style to suit all homes with over 200 colours to choose from. Ask about our exclusive range of Brella or Defab awning fabrics made and designed in Melbourne to suit the local market. Simply fill out the free quote form below. Sunblinds are a cost-effective product designed specifically for keeping heat from entering the window to cool the house. There is a large fabric range available to suite most aesthetics and they are easy to operate. Sunblinds can be applied to most windows and outdoor areas. Here are some of the benefits that Sunblinds can bring to your home lifestyle. We all know that Melbourne can have four seasons in one day. A1Blinds Sunblinds can protect your windows from all of Melbourne’s changing weather. You won’t have to worry about your furnishings getting sun damaged or fading, our Sunblinds help protect, furniture, carpets and floors. Sunblinds can help reduce your energy bills. They can also prevent the cold weather from coming in. When your blinds are down over the summer the rooms stay cool and during winter they keep the warmth in. 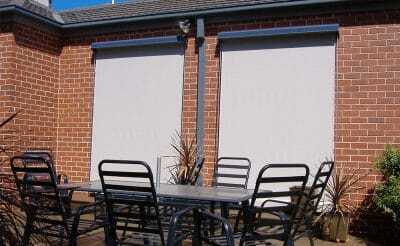 Another great benefit for outdoor Sunblinds, they can provide additional space and privacy. Adding blinds to your patio or veranda is like adding a new outdoor room to your home that can be used all year round. We have sunscreen fabric that still allow some natural light in whikle keeping your privacy, or our traditional blinds made of c anvas that block out 100% of the Sun. We have various choices of Sunblind fabric available that can be used in construction for your Sunblinds Melbourne. Some fabrics blockout the sunlight 100% where others provide partial blockout and some still allow a view. When you speak with an A1 Blinds rep, they will go into detail to help you make the right choice for your home. To give you more of an idea, here are some of the options that our Sunblinds external come in. We offer the traditional canvas material as well as nylon sunscreen and acrylics. This material is a plain weave fabric and is made from 52% cotton and 48% polyester. Sunblinds made with our canvas provide 100% blockout from the sun. This is a very versatile choice in regards to decoration because it is available in many colours and patterns. This type of Sunblind material mis perfect for when you don’t want to blockout the natural sunlight completely. Acrylic is a synthetic fibre used in the making of Sunblind awnings because it resists UV sunlight, mould, dampness, is water resistant and can stop warm air from coming through. Acrylic Sunblinds are available in multiple colours and patterns to suite your style. These are another great option if you are looking for protection without loosing a view. They blockout up to 90% of the sunlight, but still enable you to see out. Made from 100% nylon which is lightweight, fire Retardant treated and tested to AS1530 part 1 & 2 and passing NFPA 701 test method 1. Sunscreen Sunblinds also have a terrific selection of colours and tones. When choosing the right Sunblinds for your Melbourne home. You may want to consider the way in which you want to open and close the blind. There is no right, or wrong method and our sales rep will definitely inform and assist you in making the right choice for your needs. See the list below to get a better understanding of the different Sunblind operations available here at A1 Blinds. 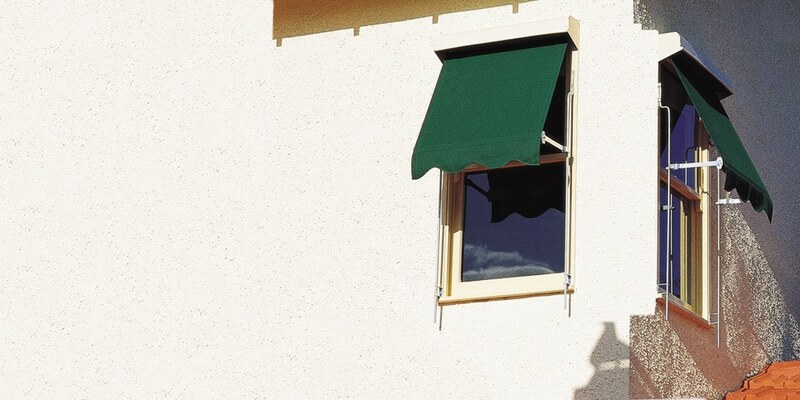 All traditional Sunblinds for outside are supported by side arms & guides. They are installed with guide rods and connecting arms and have a spring installed into the top tube to keep tension. The outdoor sun blinds can then be pulled down manually. The arms will lock into position. This type of operation is great because of the ease and simplicity. Motorisation is ideally suited for difficult to get to, high or large windows. We offer either wall switch or remote control, Smart phone and voice activation. Our ‘A’ grade electricians ensure all blinds are wired in accordance with Australian regulations. All our motorised blinds are fitted with Somfy motors, world leaders in blind motorisation and home automation. This type of blind operation is a fully manual operation which uses a crank handle to wind the sun blind up and down. It can be used with zinc coated steel guides, wire guides (stainless steel cable) or fixed down at the bottom with straps and dog clips. 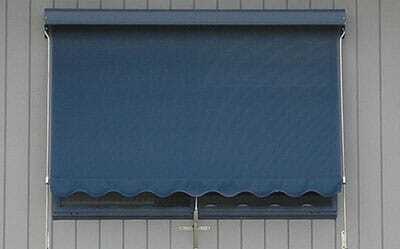 Crank Sunblinds can be used on many different applications and are a terrific option allowing an efficient and effortless way to operate a blind, especially large blinds. This option is available in crank or motorised and gives a clear unobtrusive look to compliment your home. The tradional 12mm zinc coated guides are replaced with a 3.0mm stainless steel (316) cable. The Sunblinds head box and bottom rails are available in 18 colours and will match most Colourbond fascia’s and gutters. The arms are available in sizes of 150mm, 225mm, 300mm in Aluminium 6063, 4mm thick with brass rollers (as standard) or Zinc coated steel. And for our customers who live close to the sea, Stainless steel 316 is available. Other sizes include (In Zinc coated steel only) 450mm, 600mm and 750mm. Sunblinds can be installed to most ground floor applications which include, windows, veranda’s, pergolas to name just a few. Marine grade 316 stainless steel is available for standard arms and guides and some components.. Cleaning your Sunblinds is a simple process which you can do yourself quite easily. To clean your outdoor Sunblinds you can follow the simple steps below or feel free to contact A1Blinds customer service for more details. 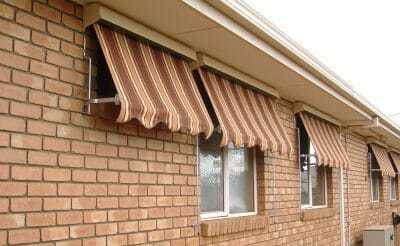 For cleaning canvas Sunblinds. You can use a soft bristled brush or soft broom for dirty areas. (Test an area first. Depending on the age of the blind some discoloration is likely. If the Sunblind has mildew, we recommend using 1 part bleach to three parts lukewarm water. Apply using a soft brush (do not scrub) and rinse off thoroughly after 15 minutes. Try to ensure that you do this when the outdoor temperature is less than 38 degrees. For cleaning your Sunblinds made from acrylic, we suggest using the following method. Use 1 cup of salt per 1 litre of water and a dash of clove oil. Use a soft cloth to gently wipe over the material. As mentioned, if you have any questions on the cleaning and maintaining of your A1Blinds, simply call with us and we will be happy to help assist.